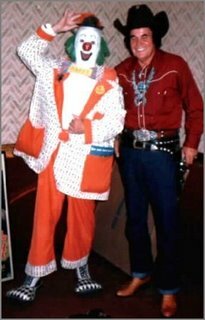 Happy with cowboy legend Rex Allen on the Happytime Circus in the early 70s. Happy with Pierce Lynden and his wife, Hazel. Happy with cowboy movie heroine Lois January. 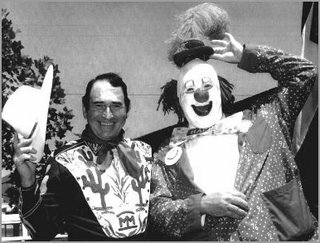 I was saddened last night to read CircusVern report that Dave "Happy" Twomey passed away September 28th at approximately 3:30 PM with his son, Ken Twomey, at his bedside. "Happy" was known for 50+ years performing on the West Coast, mainly in California at fairs with his Happytime Circus. His wife Judy preceded him in death on July 4, 2000. Twomey had been admitted to a hospital in Santa Paula, California the preceding Friday after suffering a massive heart attack while having lunch at a Chinese restaurant but family were not immediately notified because Dave didn't have a contact name in his identification. His brother Rick was used to chatting on the phone with Dave several times a week and had been unable to reach him. it wasn't until Monday that Rick drove to Twomey's apartment and found that he wasn't there so he started calling and discovered Dave in the Santa Paula Hospital on life support. Dave had been ill for more than 10 years with cancer (and had several cancer surgeries). He was on kidney dialysis for a number of years and had also had several strokes and heart attacks, which curtailed his ability to perform as well as limiting his personal activities. 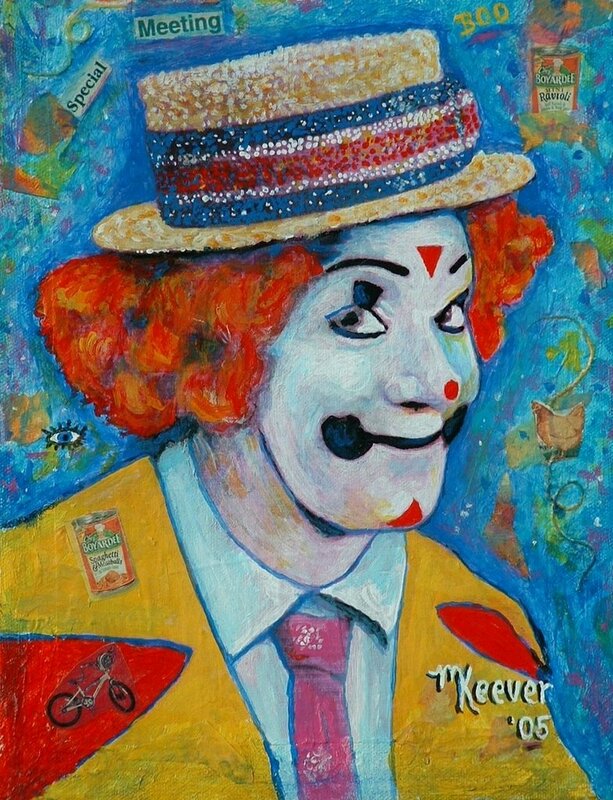 Other than a tour in the Army, Dave Twomey had always been "Happy the Clown". 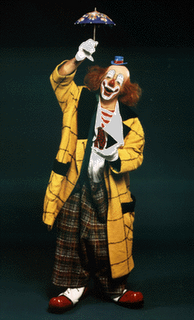 He made his debut as "Happy " as a youngster performing with the Big John Strong Circus. During Dave's Army days, he was stationed in France. He found several other G.I. 's who had circus backgrounds and put together a small street circus (no animals, seats or tent), and the group spent their off time entertaining the French children. In the 1960s, he organized his "Happytime Circus", playing mainly fairs in a small top, which held about 500 people. Dave and Judy Twomey have two sons and a grandson, and the couple had been married 41 years at the time of Judy's passing. 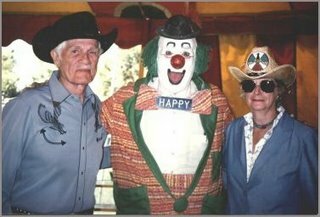 Dave was also a great fan of the B-movie westerns and during numerous conventions and such he crossed paths with many of his favorite cowboy heroes and heroines. Some of those folks even did "guest" appearances with Dave as shown in the photos above. Thanks to CircusVern and b-westerns.com for the photos and bio material. strictly speaking it isn't The Rastellis! (although I don't guarantee the spelling). mouth. Comparable to that of his predecessor. an ice rink in Italy. I refer you to the video clip I mentioned earlier. be. But notice Oreste's perfect positioning. 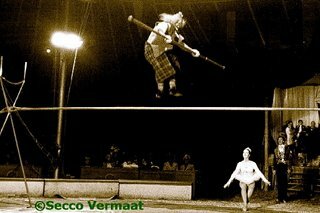 Here is someone whose photo I've seen in international circus books my whole life, but had never seen in action until last night. Variations on Walter Galetti's likeness are used on European circus posters as often as Lou Jacobs' likeness is used here in the States and last night I finally had the chance to see his comedy wire walking act done on Cirque Bouglione in the mid-sixties. If I had to compare it to anything I would say that it's kind of like watching Linon's wire walking act (available State-side in the film Billy Rose's JUMBO where he doubles for Jimmy Durante) performed by one of the Rastelli augustes, but that is a gross oversimplification. 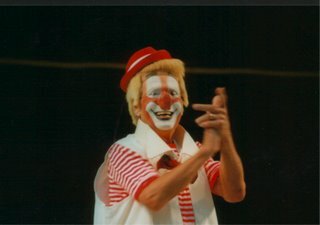 I couldn't find any substantial bio info on Herr Galetti (who is still working today, well into his 70s) but I did find that he has written an autobiography which is available on his website: http://clown-galetti.com/1280/nav_d.html . 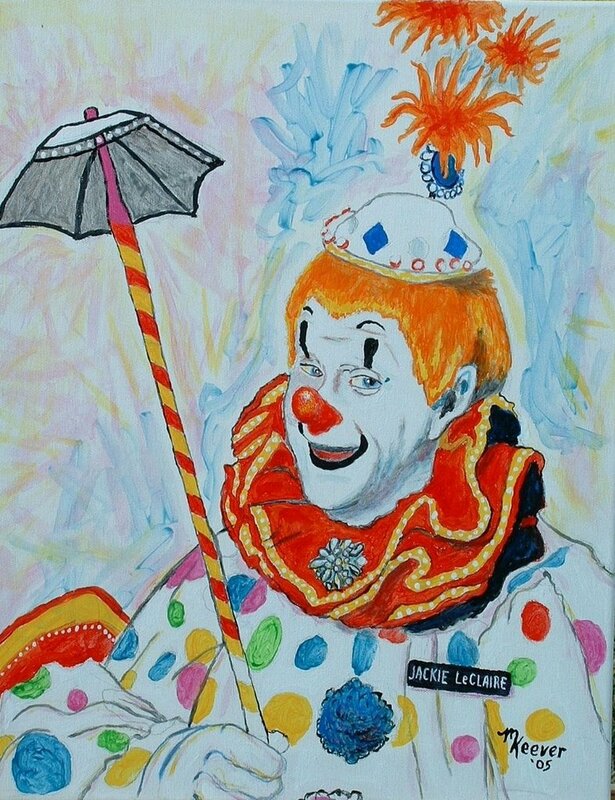 Into clown goes around the world. Five decades now already tollt it as Farbtupfer by the grey tones of the everyday life. With twenty years everything began, several times it with its home of one's own on wheels around the whole world drove. Accompanied of his Mrs. Maria, the two daughters Carmen and Mariza as well as its son Marco. 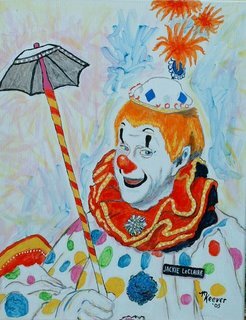 It drove on bad roads, by deserts, to always become with night, fog and snow, with the goal before eyes, of one of the completely large clowns. Why it accepts so many strains, where the pain border is when bearing the many different kinds of public. Does merry make how sad its? The folds in the face nearly 75 year are laughter and no concern folds, although it had to endure many setbacks. The small man with the large heart schwelgt smiling in memories of its adventures, high points and successes. It thanks its creator that it put a glad nature to it into the cradle. Its eyes shine, if it tells of its future. He would like to work further with Spontanitaet close on humans and simply only laughs to make. There are a few photos in the enormous Pfening file that may be misidentified and hopefully the folks here will be able to confirm just who is who in these photos. This photo identifies the subjects as Jack LeClair and Estelle Butler on RBB&B in 1941. 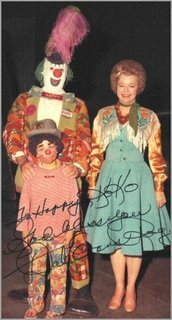 It may be Ringling-Barnum 1941 and that might be Estelle Butler but I'd bet dollars to donuts that this clown is a young JACKIE LeClaire, not his father Jack. Another possibly misidentified subject: This photo is identified as Slivers Johnson on Sells-Floto in 1914. It may well be Sells-Floto in 1914 but that appears to be SPADER Johnson (contemporary of SLIVERS Oakley), not SLIVERS Johnson. I've only seen a handful of photos of either, can anyone else confirm or deny? 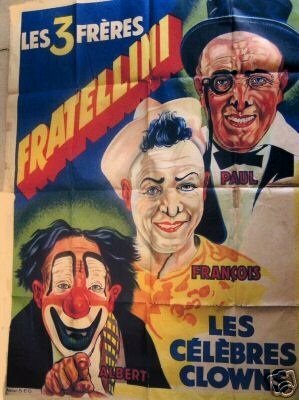 A poster with no mention of the name of the show at all... only the star attraction, the quintessential clown trio: The Fratellinis. From top to bottom: Paul the classic auguste turned contre-auguste, Francois the most classic of whitefaces and Albert the man who re-created and forever changed the role and appearance of the auguste. As for yesterday's post, I've received a few messages from folks telling me stories about how nice it was to work with and for Emmett Jr. on the Emmett Kelly Jr. All-Star Circus in the 70s and early 80s. 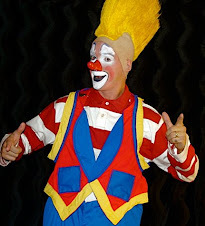 I'm not saying that Emmett Jr. icouldn't be a wonderful person and a great employer, I just don't see him as a particularly exceptional perfomer or circus clown. His father, the man who crafted that material and persona, was. 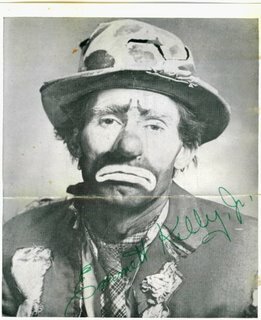 Emmett Kelly and Emmett Jr.
For those who still can't tell them apart, or don't know that there is a marked difference between them, today we look at Emmett Kelly and Emmett Kelly Jr.
Emmett Kelly was born December 9, 1898 in Sedan, Kansas, and began his career as a trapeze artist. 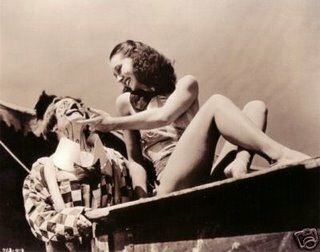 In 1923, Emmett Kelly was working his trapeze act with John Robinson's circus when he met and married Eva Moore, another circus trapeze artist. 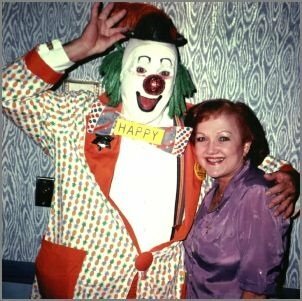 They later performed together as the "Aerial Kellys" with Emmett still performing occasionally as a whiteface clown. He began working as a clown full-time in 1931, and it was only after years of attempting to persuade the management that he was able to switch from a whiteface clown to his now-famous tramp character. 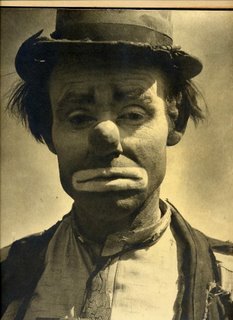 That character, "Weary Willie", was a clown who, rather than go for the laugh, instead appealed to the sympathy of his audience. 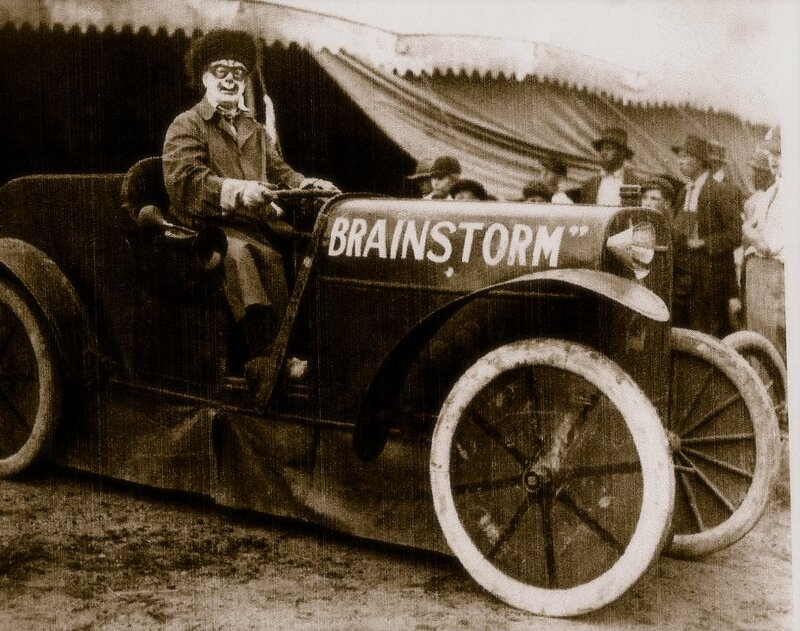 His approach was revolutionary for it's time: traditionally, circus clowns wore whiteface and performed elaborate slapstick stunts intended to make people laugh. 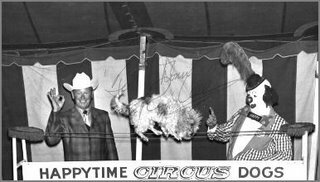 Kelly (and, more importantly, his versatile mentor on the Cole Brothers Circus, Otto Griebling) helped to usher in an entirely new rhythm and style of circus comedy. From 1942-1956 Kelly performed with the Ringling Bros and Barnum & Bailey Circus, where he was a major attraction. He left after the AGVA strike of 1956 and spent the next two seasons in New York City performing as the mascot for the Brooklyn Dodgers baseball team. He continued to appear as a celebrity attraction on spot dates, with Shrine Circuses and in nightclubs for the remainder of his career. He also appeared on Broadway, on television and in film roles. Emmett Kelly Sr. died at the age of 80 of a heart attack on March 28, 1979, at his home in Sarasota, Florida. He is buried in the Rest Haven Memorial Park, in Lafayette, Indiana. Emmett Jr. is a United States Navy veteran and former auto mechanic who successfully traded on his father's celebrity to carve out a career for himself by appropriating his father's likeness and his most famous routines. He is best known as the subject of a long running series of collectible figurines that give the impression that he enjoyed a long and distinguished circus career. He, in fact, did not. 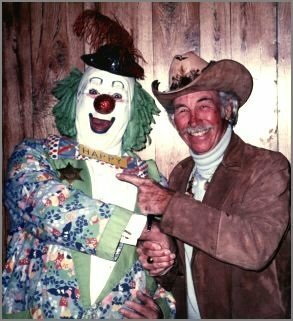 Emmett Sr. was a circus clown. Emmett Jr. is a successful marketer of chochskis. Guess Which One Was Known as "Chesty"! The Answer May Suprise You! I've finished up my circus season with two shows in Jamestown, NY yesterday that were poorly attended because of the Buffalo Bills season opener. These swine would rather watch football than attend a circus?!? No wonder Lucille Ball left this hick burg as soon as she could! The shows went well though. In fact, most of yesterday went very well. As soon as I finished posting I went downstairs, had my breakfast and the clouds parted and the sun started shining. My mood lightened considerably when the woman at the front desk pointed out that my picture was on the front page of the newspaper. Always a nice start to any day. In fact the only downer yesterday was that I met a clown who had been on the Beatty-Cole show when I was a kid. 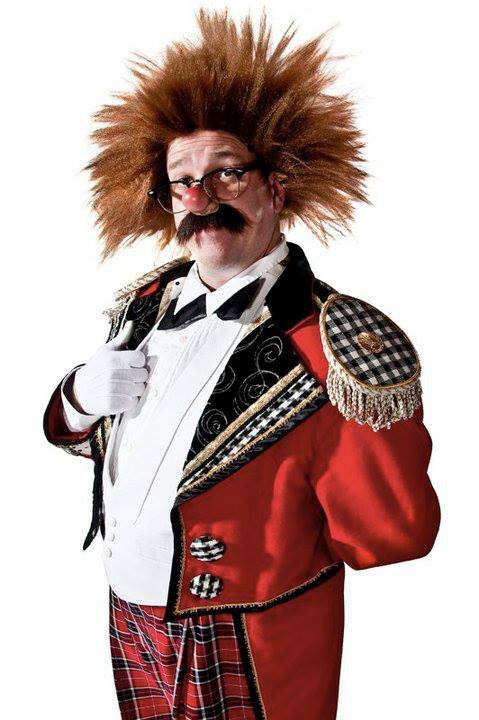 He's been kicking around the circus industry ever since and was proof positive that maybe I DON'T want to meet all the clowns that I remember from my childhood. What a thoroughly unpleasant experience. Having met him, I can now completely understand why a certain circus producer punched him right in the mouth a few years back. I find it hard to believe that it doesn't happen to him every day. 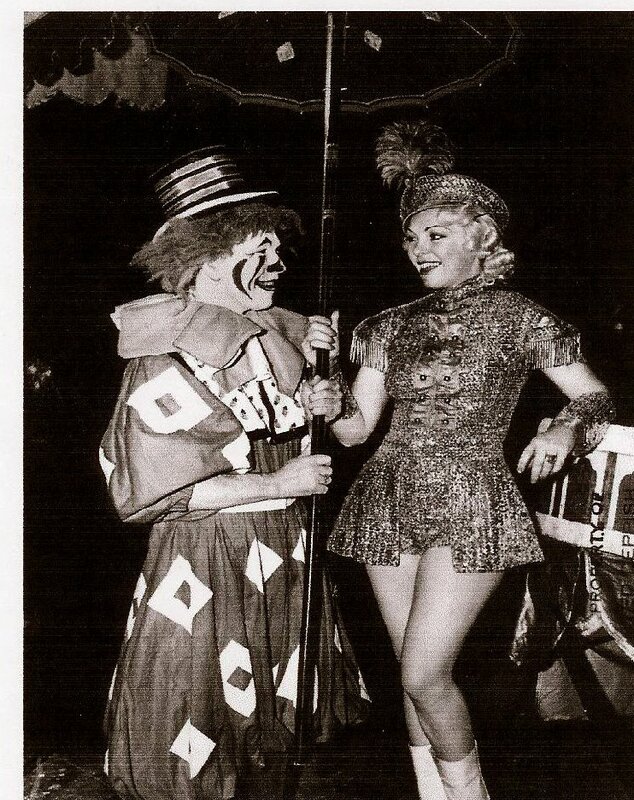 So, in an effort to clean the palatte after that experience, here is a great photo from the Bill Strong Collection of a clown I'm sure that I would have enjoyed meeting much more: Paul "Chesty Mortimer" Mortier beeming beatifically as he flirts with a pretty showgirl. 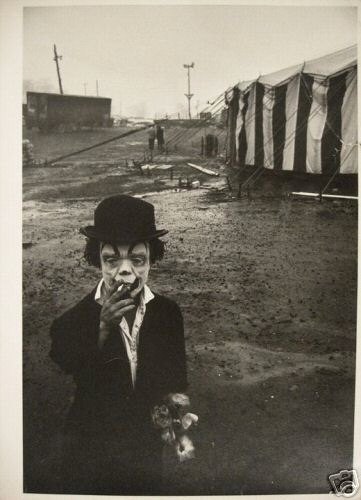 I think this photo of Jimmy Armstrong best sums up how it feels to be a circus clown in Jamestown, NY today. The guy who came up with "May All Your Days Be Circus Days" wasn't talking about circus days like this. 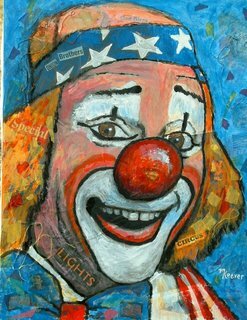 It's the last day of my 2006 circus season. A rainy day in Jamestown, NY, birthplace of Lucille Ball. The show goes on for one more date in Rochester, MN but I can't be there. No matter. I've always looked forward to working these dates before but this year it just wasn't as much fun. 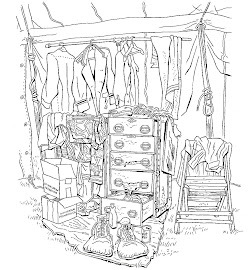 I'm sitting in my room at the Comfort Inn and listening to Brian Eno and Harold Budd's Ambient Music 2 and I think that I need to see some more of Cowboy Mike Keever's artwork to lighten my mood and get me ready for these last two shows. Mike's art always picks me up. So does hearing a nice fast rendition of the Dixieland standard "That's a Plenty". Maybe I just need to blast some Dixieland through this room, get some coffee and enjoy my "complimentary continental breakfast" and things will seem a little less gray. Chuck Sidlow, former Ringling Boss Clown and currently working with Pedro Reiss and Dolly Jacobs' Circus Sarasota.